A wise man once told me to document and capture the roughest part of any excursion you take. It’s often in these moments that you are best able to understand where you are strongest and weakest. He also told me to do or do not, and that there is no try. While that particular being has physically faded into obscurity, I find myself taking his advice this evening as I recount a day that could have spelled a major pause (but never the end) of the By 2 Pedals adventure. Hey mom - I just sent dad and sean a message. Can you have them check their email? Sorry to put this on you guys. 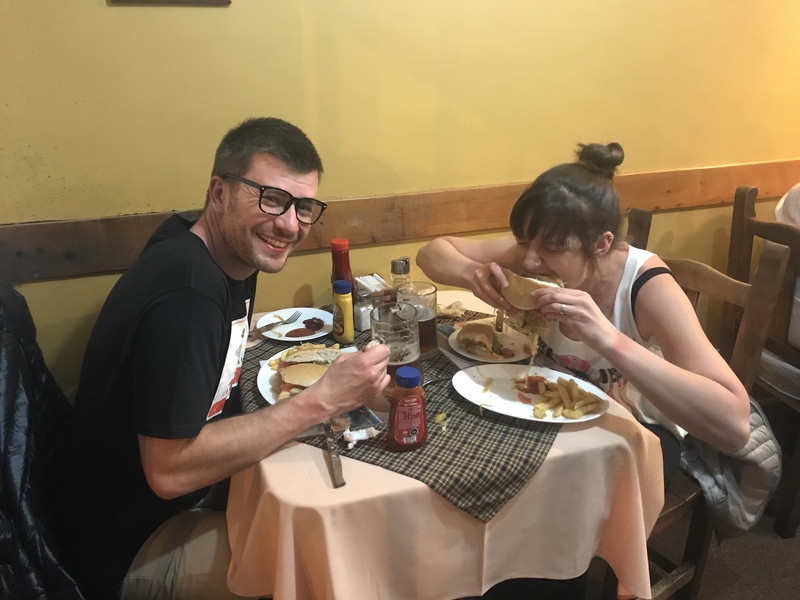 We just got robbed in Chile and I need some help. We are safe and sound and seriously okay so don’t worry. Looking at that message now, it makes absolutely zero sense that my Mother would look at this and be like, Well.. He did say he was “seriously” okay… so I’m sure all is well. Let’s see what’s on TV later. After all… why would I worry about Andrew? Sometimes I am a real ninny. It is unfortunately true that, what could have been thought to be a “nightmare” scenario did occur yesterday. I’ll get to the details in a moment, but first, I figured I would recap all the good stuff that led up to this event. The first day out of Puerto Montt was marked by heavy traffic and hairy riding, followed immediately by some of the most scenic and amusing roads I have ever been on. The industrial roadways that took us out of the city certainly tested Suzie and my patience as trucks passed honking on two-lane roads and then spat black fumes from the muffler into our heavily breathing faces. You know what’s not ideal while panting up the first hill you’ve biked up in about 6 months? Doing it in a setting that should only be reserved for chimney sweeps and West Virginian miners. I definitely now have the black lung, Pop (cough, cough). Once we reached the lakeside town of Puerto Varas, all this changed drastically. Suddenly, the roads were virtually clear, there were fewer potholes to maneuver around, and in front of us was a picturesque mountain range with leading cast member Volcan Osorno and Volcan Calbuco. 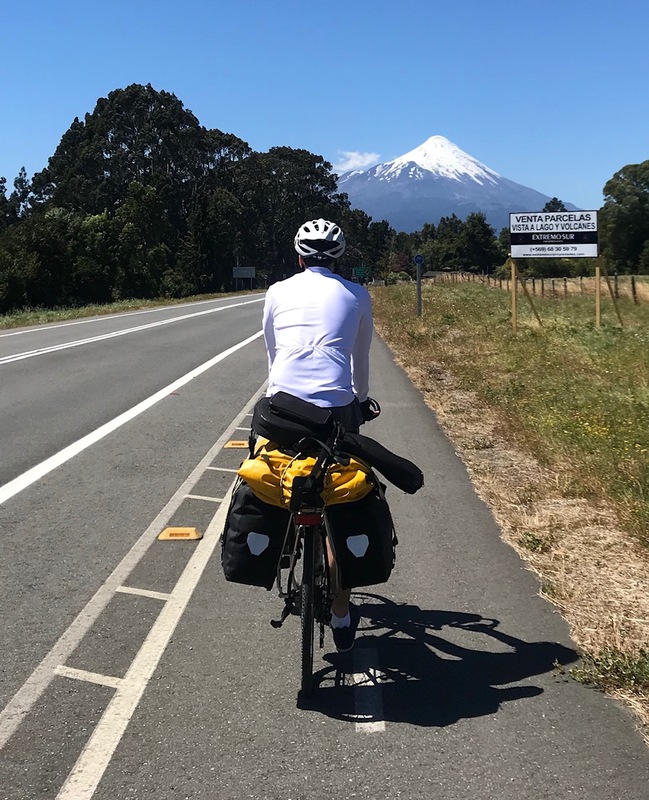 It’s hard to put into words how beautiful riding towards this range with the massive Lake Llanquihue on our left really was. Volcan Osorno towers above the road unceasingly, growing slightly closer to us with each pedal. She is the star of the show with her snow capped peak and evergreen glazed base, which stretches on for miles. Calbuco lurks to the right, larger and imperfect in her jagged shape. It bears a striking resemblance to Mount Doom in Lord of the Rings, and it erupted only 3 years ago, blasting through its western slope and wreaking havoc in the neighboring country of Argentina. As we gazed at this scene the roads wound up and down and took us past spectacular gorges and cascading waterfalls. With little traffic and a bike lane to boot, we were free to bike alongside each other and swerve effortlessly with the road. With Osorno and 6PM behind us, we started to think about camp for the night. As we got a rather late start getting out in the morning we were determined to still make our 100 km (60 mi) goal for the day. We passed a beautiful campsite in the town of Las Cascades, which haunts me with echoes of “what if” as I write this. Rather than stop, I suggested we power on. The sun doesn’t set until about 9:30 PM here, and our map showed a spot to stay a mere 20 km (12 mi) up the road. That campsite never appeared, and we ended up slogging out the next 49 km (~30 mi) with no option but to reach Puerto Octay on the north end of the river. There was no direct route there, so it made the mental battle much more difficult knowing we were taking 2 steps backward and 1 forward to reach this point. With the sun setting behind the farmland on the eastern shores of the lake, we finally reached town worse for the wear, got gasoline for our stove, hit the supermarket, and checked into a small but expensive campground along a river. It was a bit stressful setting up camp, cooking food, and getting all our gear in order in the dark, but we made it happen and gratefully conked out after a long day of pedaling. In the morning, we got another late started and decided to haul as fast as possible to Osorno. It was 50 km (30 mi) away, and we were determined to reach this by lunch. Traffic picked up as we got closer to the city, but we remained in good spirits despite almost being pushed off the road three times by large semis. In Osorno, a dark shadow fell upon us. We wanted to stock up on food for the day and breakfast the next, and as we pedaled into town we ran into a Lider, which is basically the “Walmart” of Chile. It seemed like the perfect stop, as it was not far off our route and it had everything we needed. We locked our bikes in front of the store near a few construction workers, secured our belongings, and walked hand in hand into a food “shop-till-you-drop” paradise. I’ll pause here and say this: this is a typical way we have always… always, shopped for food on cycle tours. Even in the Balkans (aka Old Yugoslavia) with 4 people, we would all go in to a store and have faith in humanity not to mess with our belongings. We’ve done this in 20 countries thus far, including the US, and we have never had a problem. Never that is, until now. I left the store first (Suzie went to fill our water bottles) and, as I walked with an arm full of all the accoutrement needed to make a bomb-a** tortellini and pesto diner later, was met with a scene of confusion. There, where my bike previously stood holding two rear panniers, a large yellow roll bag, and mandolin case, there was now only three bungee cords hanging without tension from my back rack. It only took a second for it to hit me: we had been robbed. Though I didn’t remember exactly what that meant at the time, I was stripped of all my clothing (and they didn’t even slip me a 20! ), my computer, hard drive, our sleeping bags, our ground mats, my Bear Gyrlls hatchet, our extra water bag, camp pots, camp cups, a wallet with $300USD, my rain jacket, warm coat, sweatshirt, shoes, sunglasses (a birthday gift from Suzie), and my dear Mandolin I named Mandy. And the one speck of food that they left in the house was a crumb that was even too small for a mouse. Much like our bed bug incident in Germany, though Suzie’s bike was next to mine, her belongings were untouched. My front panniers were also still attached and unmolested, so at least we didn’t lose the whole farm. Punch-drunk and alone beside my remaining items, a concerned passerby stopped, rolled down his window, and asked if I was okay. I explained the situation and that I was pretty sure they thief also got my passport in the gold mine they swiped away. His jaw dropped, he told me to hang on, parked his car, and came over to help assess the situation. Suzie followed out and, recognizing all was not right with the world, dropped her hands by her side with a look of daze and confusion. The man who stopped is our new friend Sebastian, who is a true saint. He stuck with us and translated as we asked the construction workers what happened and called the police. They say evil prevails when good men fail to act, and these Men at Work did exactly that. The construction worker who waved to us when we parked our bikes later told Sebastian and me that two young men had approached my gear, cut it from the bike, and then walked away across the front of the store. He had just watched, not thinking it was his business. Dude. Come. On. As the police arrived, I breathed a sigh of relief in locating our passports in my front bag. Suddenly, things were not so bad. Both of our moods picked up, knowing we would not have to jump over the hurdle of getting those replaced in Chile, which likely would have spelled the end of our South America stage. 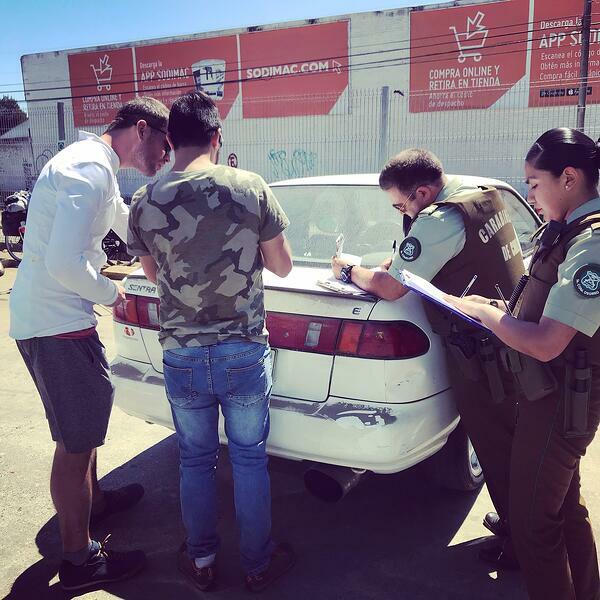 Baking under the Chilean sky, Suzie and my sunburns worsened while filing the complaint with the Carabineros (Chilean police) through Sebastian. 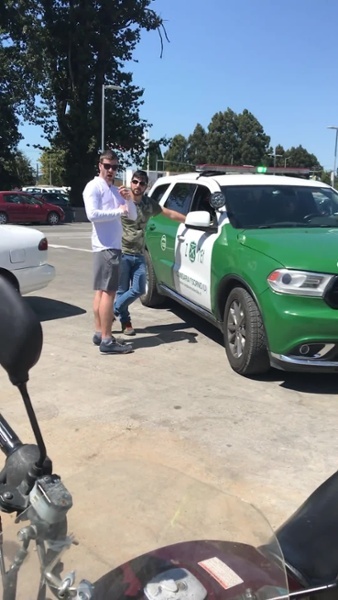 After about a half hour, they shook our hands and let us know we needed to go to the PDI, the Investigation Police, to speak with them next. So, we parted ways with Sebastian, thanked him profusely for being the man of the year, and got back onto our bikes. 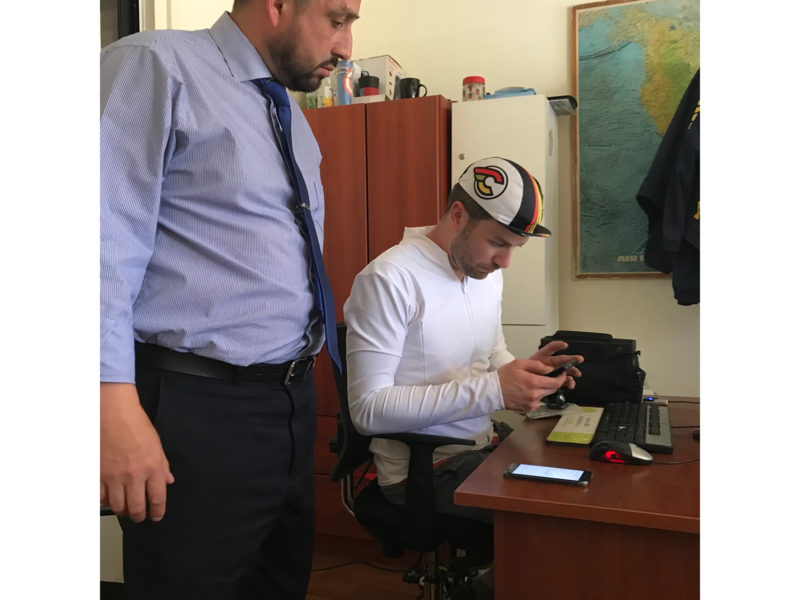 Despite this setback, Sebastian symbolizes how friendly, helpful, and downright good the people of Chile have been since we have arrived. A rough experience like this might lead one to overgeneralize in the negative direction, but I still love the people of this country and refuse to let one bad apple turn this perspective sour. We found our way to the PDI closer to the center of town and re-explained the situation to the English speaking Investigators. They were super helpful and sympathetic to our experience and they let me use their phones and internet to block access to my Chromebook and disable a few other key accounts so that the thieves wouldn’t be able to do any digital damage. This is where I also began this tale, in sending my family back in Maine the request to help shut down my LastPass (a password management tool) account. Special shout out to Sean G from the 04090 for the help with this! Couldn’t have done it without you buddy! Sun-burnt and exhausted, we checked into a nearby hotel and made our way to the mall to begin the long process of replacing my clothing and our gear. I won’t go into a ton of detail on this (even though I know a long write-up about a shopping spree sounds super-duper exciting to you all I am sure), but I will say that after 4 hours and with the sun setting behind the city of Osorno, I started to feel whole-ish again. It was blissful to finally be able to shower and have clean clothing to change into. Through it all, the two of us stuck together and squeezed all the positivity out of a difficult lesson that we possibly could. We’ll never again have the same faith that we previously did, however, we will not let one event allow us to assume the worst in people. Rambunctious caution is how we now live our lives. For the next few days we’ll file insurance claims, re-visit the police a few times, and finish replacing my belongings. We hope that after leaving the Police Records office on Monday morning, we'll finally be able to escape the beautiful but daunting shadow of Osorno. Though fear won the morning, as we opened the door and asked a woman in the hallway what to do next, she laughed at us and let us know it was just a test. We were safe… and always had been. But seriously…. Who tests a Volcano alarm at 9am on a Saturday!!!!! Come on Osorno!